Condominium rental unit #709 accommodates up to 4 people with a king size bed in bedroom and sofa sleeper in living room. 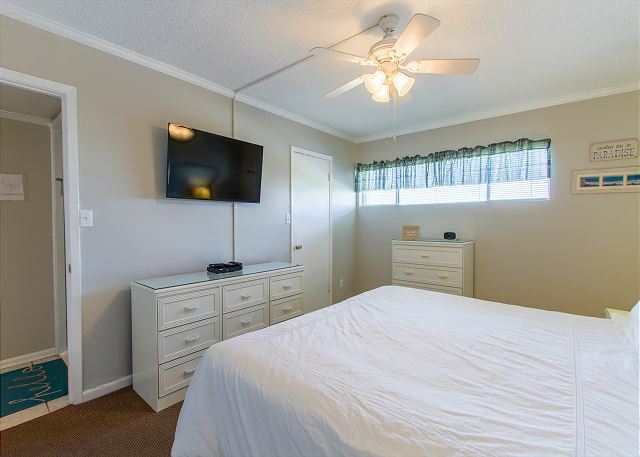 Unit has tile floors throughout with carpet in the bedroom and a beautifully updated kitchen with quartz counter tops and stainless steel appliances. 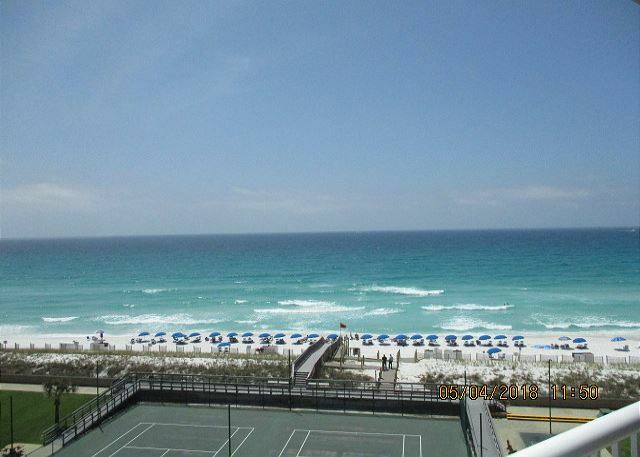 Enjoy the beauty of Destin`s pristine beach from your private balcony. 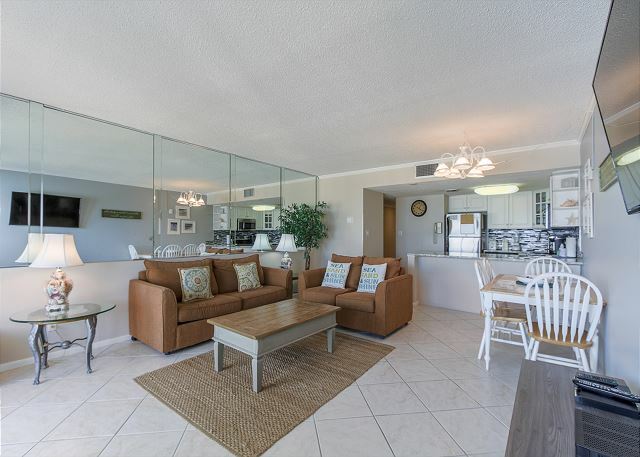 The pool,sport courts and complimentary beach chairs are just steps away. Make your reservations today! Enjoy complimentary Xplorie excursions to enhance your vacation. Overall we were very happy with this 7th floor unit. We didn't hear anything from neighboring units. The views from the balcony are amazing (But the slider doesn't close properly or lock and is difficult to open/close) Kitchen has been recently renovated and probably the nicest part of this unit. The king size bed was comfortable, plenty of closet space and dressers. The shower was good. We never received fresh towels (we had 3 total that we used over 5 days). We were told they only change towels twice a week, but we never got fresh ones. The couches are probably the one thing that could use upgrading. They are dated and musty smelling. My daughter slept on the pull-out bed and had we not brought our air mattress, she would have been very uncomfortable. We were close to great restaurants and different attractions, Although there was a lot of road construction and traffic! Target was very conveniently a couple minutes away, which was great because we needed to get food and supplies for the week. The week we were there, there was a lot of military air traffic! So being on the top floor gave us an amazing view of that as well! It was super cool and we LOVED it! Being able to see Apache and black hawks helicopters among others! The day we arrived the Blue Angels flew past too! The beach was absolutely beautiful! Surprisingly it was not over crowded (for it being Spring Break). Sand was white and soft. The water was still pretty chilly (late March) but water was so clear!! Umbrella and chairs supplied and also paddle board/kayak rentals priced very reasonably. We appreciate you taking the time to review your experience. Corrections are underway. Thank you for complimenting the Rental Manager. Feedback helps us to improve. We hope you will return. The condo was wonderful. It worked great for my family of 4. Brand new kitchen and appliances were awesome! My only complaint is the porch/patio furniture is very cheap. It would have been a little more enjoyable to set on nicer patio furniture. But overall I was happy with the decision to stay there. 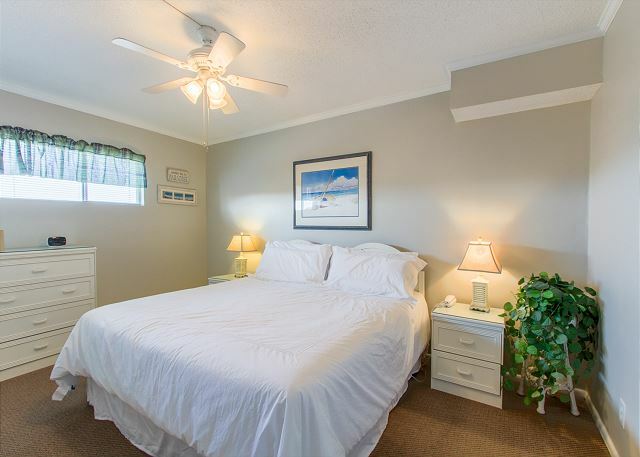 Great location in town and on the beach, and it's off Highway 98 so there was easy access to the property without the highway congestion. The room had all the appliances and amenities we needed for our weeklong stay. Some of the furniture could be updated, as well as the bathroom, but we came for the beach. We used the room to sleep and change so it wasn't a dealbreaker for us. We liked the direct beach access without a long walk, and enjoyed the beach service of umbrella and chairs. Overall the room and property itself was fine, nothing impressive but nothing terrible either. My personal preferences of multiple elevators (they have 2), the room door opening to the inside rather than out (for safety reasons), and on-site food/beverage options (other than vending machines or deliver) were lacking, but again none of it was a deal breaker. I don't HAVE to stay here again and would be willing to try other properties, but this was fine for what we needed. Best place we have stayed in Destin! The room was just amazing. The condo was very clean. The view was amazing of the ocean and pool. The beach was amazing having the chairs included with our stay was an awesome perk. This place is where we will be coming back to for years to come. This condo was everything we hoped for and more! 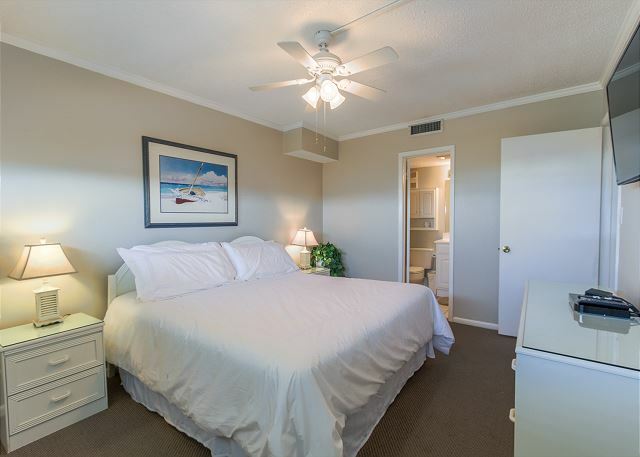 Location was perfect, close to all the best restaurants, Target, and steps from the beach. We will absolutely be returning. Great location. View from condo was perfect. The beach service is a nice perk. Condo was good enough. Could use maybe a few updates. Friendly staff and helpful in every way !! Unit did not have an iron or hair dryer , made a call to front desk and they made it all appear. Came in on Mar 30 and stayed the weekend until Apr 2. The condo was nice! Perfect for the weekend. The view was amazing. Staff was friendly and helpful. We always enjoy staying at holiday surf and racquet club. Since staying in '15, they had renovated the main lobby which was very updated and nice. 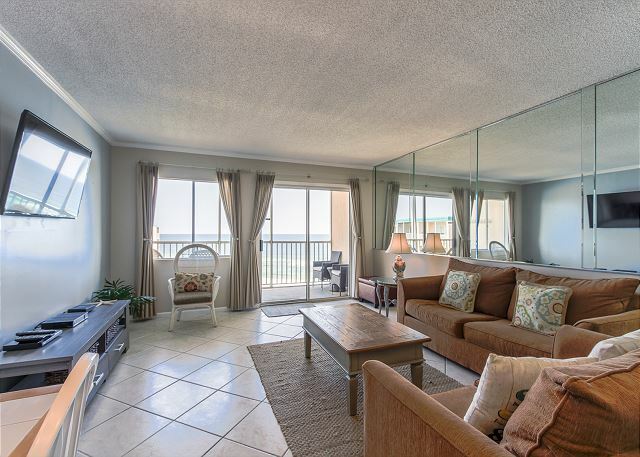 The condo is perfectly located in the spotlight of Destin but secluded to where you're away from the noise. Everything you want to do while on vacation, (board walk, restaurants, mall), is less than a 10 min drive (depending on traffic). We stayed in room 709. It had everything we needed, updated and decorated very nicely and the view was amazing. 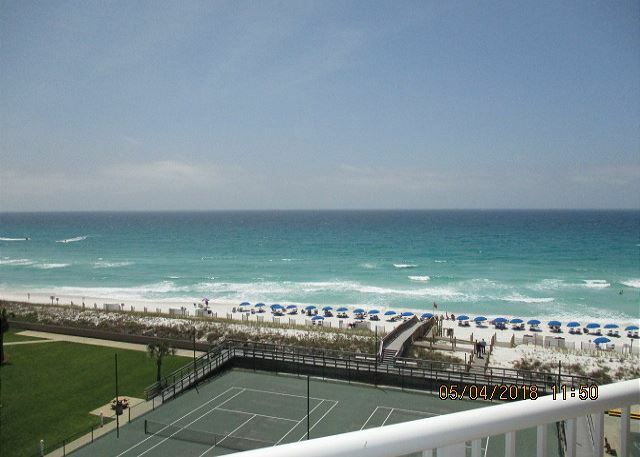 We always recommend for anyone going to Destin to stay here. At holiday surf. They have never disappointed us. Thanks for another pleasant vacation. We didn't want it to end.